Despite only being the second week in September, from the telephone calls I’ve had recently with clients, for some of you the summer holidays are starting to feel like a distant memory. I’m already working with a number of clients on lots of great trips for 2017. Some far afield, others closer to home, but all with that little “la Concordia touch” which means that they are going to be perfectly executed, stress free and seamless from start to finish. One place that Julian and I visited recently which I’m raving about to clients is the island of Ile de Re, a gorgeous place on France’s Atlantic coast. I’d wanted to visit for such a long time and this year I finally got my wish, and I have to say, it certainly didn’t disappoint. It ticked all the boxes: short flight (1½ hours from Manchester to La Rochelle); no jet lag; great food and wine; no driving; and lots of time spent outdoors. In fact I’d go as far as to say Il de Re is an ideal holiday destination whether you’re a family looking to keep everyone entertained or a couple wanting a short break. The villages are ever so pretty with white washed houses adorned with painted shutters in muted shades - like a tiny corner of a Farrow and Ball paint chart - and framed by spires of colourful hollyhocks. There’s nothing tacky or offending to the eye. Even the electricity and phone cables are underground. It’s tasteful and stylish but in an understated and laid back kind of way. The island is accessed by a 3km arching bridge from the mainland and the taxi transfer from the airport is the only time you will need to sit in a car. The favoured means of getting around is by bike; whether that’s the usual two wheels, a tricycle, tandem (say no more), an adult bike with child attachment or a bike with a trailers for babies (and dogs). Anything goes. 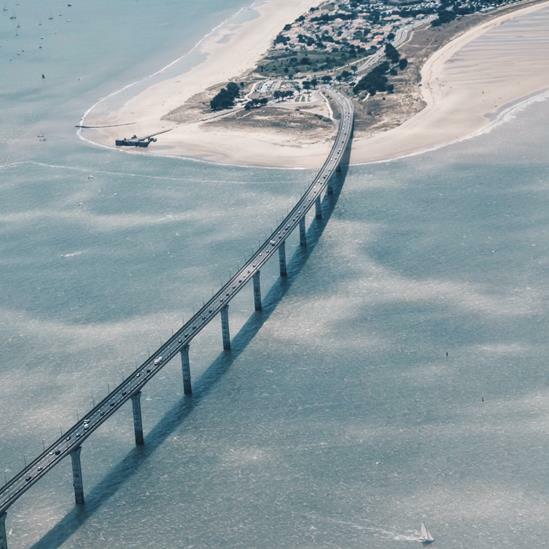 To make things even easier, the island is criss-crossed with cycle paths that weave through pine forests, past stunning poppy fields, vineyards and the salt pans where the island’s fleur de sel is harvested. It’s all very flat and sedate so helmets and lycra are optional. We rented a rather chic house on a pretty cobbled street in the picturesque main town of St Martin de Re. Each morning we stocked up on delicious goodies at the daily market. What a treat. 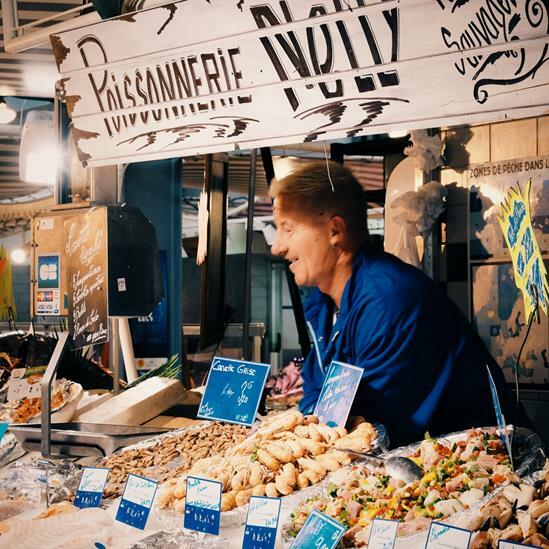 It sold everything from local cheese to fresh bread and pastries, all number of varieties of saucisson and the most phenomenal seafood. There was no need to ask whether it was fresh - it was - straight from the sea that day. Our days were spent strolling the star shaped ramparts that surround the town and then queuing up for the best artisan ice cream at La Martiniére on the harbour front (the salted caramel flavour made with local fleur de sel is divine). We cycled the length and breadth of the island and picnicked on the beach. The coast is very reminiscent of Norfolk with vast swathes of sand and even bigger skies. The sea can be a little choppy. The Atlantic breeze, a relief when the sun’s out, can be bracing when not. Back in Saint Martin de Re, on days when we didn’t cook up our market purchases, we sampled the delights of the local restaurants that line the quayside (I’ve found some real gems to tell clients about), each housed in elegant weather beaten buildings, and all serving exceptionally good food. Ile de Re is one of those places where you can escape from your frenetic life at home. As a holiday destination it’s as you want it to be; it doesn’t disappoint and is entirely fulfilling. If you’d like your next holiday to be like this, then just drop me an email (lesleyann@la-concordia.co.uk) or give me a call (07734 540914). I can create a wonderful trip for you without you having to spend ridiculous amounts of time doing it yourself, confident in the knowledge that it will be just right.